Overview - A group of young gunmen, led by Billy the Kid, become deputies to avenge the murder of the rancher who became their benefactor. But when Billy takes their authority too far, they become the hunted. "Six of the hottest stars -- Emilio Estevez, Kiefer Sutherland, Lou Diamond Phillips, Charlie Sheen, Dermot Mulroney and Casey Siemaszko -- take on the Wild West in this heart-stopping, gunslinging action-adventure!" So begins the plot description on the back of the Blu-ray box, and for once, there is truth in advertising. That one sentence just about sums up 'Young Guns,' the 1988 hit that brought the Brat Pack to the Old West and made the world safe for cowboys with plucked eyebrows. With all the authenticity of the "Butch & Sundance Stunt Show" at Universal Studios theme park, this is about the most ridiculous, unrealistic "Western" ever to grace the big screen. The year is 1878, and we are in Lincoln County. 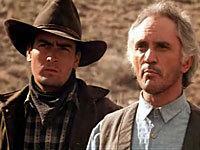 John Tunstall (Terence Stamp), a British ranch owner, hires six rebellious boys as "regulators" to protect his ranch against the ruthless Santa Fe Ring. 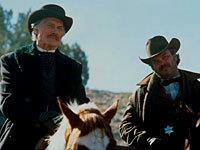 When Tunstall is killed in an ambush, the Regulators, led by the wild-tempered Billy (Estevez), declare war on the Ring. As their vendetta turns into a bloody rampage, they are branded outlaws, becoming the subjects of the largest manhunt in Western history. I dunno, I just couldn't take 'Young Guns' seriously. It is not that these aren't good young actors (even Charlie Sheen can deliver a real performance when he wants to) but the idea of a group this homogenous and impossibly good-looking turns the film into the 'Top Gun' of Westerns. Everything about 'Young Guns' feels too manufactured. The pandering to the young female set is particularly shameless (lots of scruffy pouting and heaving bare chests), and the bombastic score is rather ridiculous in context of the subject matter. The movie is also surprisingly gratuitous in terms of its violence. For a film that is essentially geared for the MTV crowd, it's as if the filmmakers think they're remaking 'The Wild Bunch,' so copious is the bloodletting. But the clash of pretty boys and hard-edged violence is merely incongruous -- not shocking -- and it fails to mesh with the more pop-like sensibilities of the rest of the film. Of course, 'Young Guns' is still a lot of fun, mainly because almost twenty years on, just about every then-young actor in the film has gone on to bigger and better things (only poor Siemaszko is, in hindsight, the odd man out). Director Christopher Cain ('The Next Karate Kid,' 'The Amazing Panda Adventure') also invests as much energy as he can into the film, and the momentum certainly never lags. It's just too bad the film didn't aspire to be more authentic. 'Young Guns' works now only as nostalgia, a flash back to a more innocent time when the mixing of hip young stars, a fast pace and "edgy" violence seemed fresh and inventive. Maybe it is unfair to compare 'Young Guns' to a 'Dances with Wolves' or an 'Unforgiven,' but a little bit of believability and a little less posing could have gone a long way toward giving the film a resonance beyond a just a bunch of good-looking faces on a movie poster. Lionsgate previously "remastered" 'Young Guns' for a 2002 standard-def special edition, but unfortunately that release was pretty weak, and this first-ever Blu-ray version appears to have been minted from the same master. The film is presented in 1.85:1 widescreen and 1080p/MPEG-2 video, but the source just hasn't held up particularly well. To be fair, it is pretty clean, with only a speckle here or there, and only spotty grain in darker scenes. Colors are fair as well -- brighter exteriors have a nice, dusty feel, though there is still a bit of oversaturation, especially fleshtones, which veer toward being pumped up to the point of looking waxy. Detail, however, is where things really go downhill. Interiors and dark scenes suffer most, with the fall-off to black quite harsh. I really longed for brighter contrast -- the image seems to flatten out quite a bit in the mid- to high-range. I also saw some obvious noise in a good number of shots -- enough to be distracting. Overall depth, meanwhile, is fine but hardly superlative. While this is certainly not the worst transfer I've seen on high-def, it is without a doubt the weakest Blu-ray effort yet from Lionsgate. At least the audio is a bit more perky. 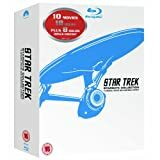 Lionsgate offers two mixes: a DTS-HD High-Resolution 6.1 Matrixed Surround (not Lossless Master Audio) and a Dolby Digital Surround EX, and this is a nice remaster, with a fair amount of surround activity that really shines during the action scenes. 'Young Guns' isn't wall-to-wall gunfights, but those sequences are certainly the most effective. The rears kick in nicely here, with fairly aggressive activity, nice transparency and a full-bodied sound that is above average for a film of this vintage. That said, it is gimmicky -- front-to-back effects feel particularly jumpy, as if sounds are "leaping" suddenly -- but at least it is consistently employed. Dynamic range is a little less realistic. Low bass is solid, if a tad flat. Some of the dialogue also sounds a bit fake, especially offscreen dialogue, which sounds obviously ADR'd. But volume balance remains pretty good, and only during the loudest action moments did I need to turn down the levels to bring the effects down to a more agreeable level. Still, for a remaster of what is essentially a mid-budgeted teen western from 1988, 'Young Guns' arguably sounds a lot better than it ought to. Lionsgate has regurgitated 'Young Guns' a zillion times on standard-def DVD, yet somehow the extras on those releases never got all that much better. 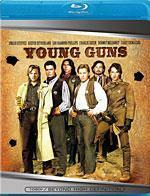 The majority of the film's hot cast chose not to contribute any fresh interviews, so even the most recent 2003 special edition of 'Young Guns' was no great shakes. For the film's Blu-ray debut, the studio has repackaged most of those same extras, though not all. Oddly, the best extra from the standard-def DVD (a screen-specific commentary with actors Dermot Mulroney, Lou Diamond Phillips, and Casey Siemaszko) is not included even though it was a simple audio track. Instead, we get the "Gunning for Facts" trivia track. Though the back packaging labels it as "enhanced," I didn't see anything new or special about it, aside from redesigned text overlays. The factoids are pretty much what you expect -- some poor intern at Lionsgate had to spend a couple of days combing through the IMDB, pulling together banal trivia about the film's stars and production. The scant historical material about the "Old West" is also about as incisive as the Great Thunder Mountain Railroad ride at Disneyland. Alas, there is no theatrical trailer included, nor any other promo items. 'Young Guns' is a real guilty pleasure -- a slice of '80s nostalgia where Teen Beat meets the Old West. Far more notable for its cast of future stars than its forgettable plot, it is probably the only film that could make a great triple bill with 'First Blood' and 'Dirty Dancing.' Unfortunately, Lionsgate offers up an unexceptional Blu-ray disc for this one -- the transfer, soundtrack and extras are all lackluster. Even diehard fans probably won't find this enough of an upgrade over the previous standard-def edition to warrant a purchase.